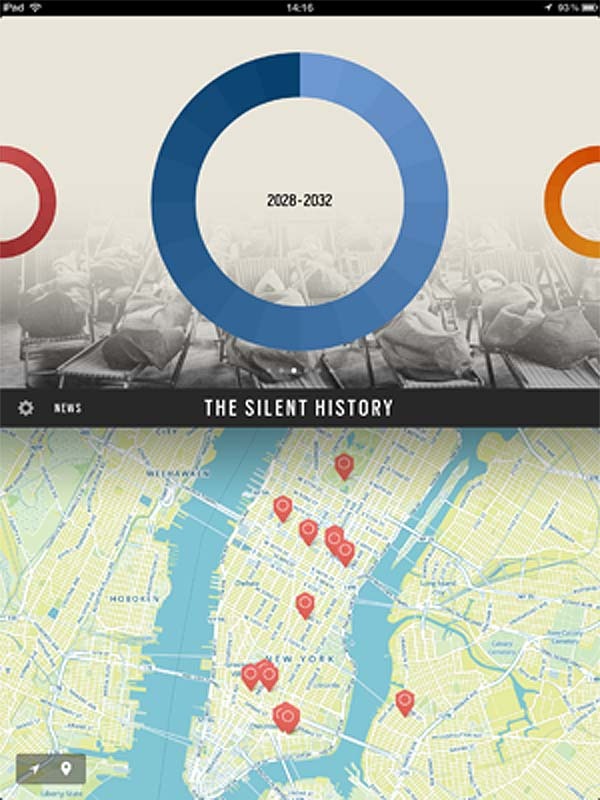 The Silent History is a groundbreaking novel, written and designed specially for iPad and iPhone, that uses serialization, exploration, and collaboration to tell the story of a generation of unusual children — born without the ability to create or comprehend language, but perhaps with other surprising skills of their own. The multimedia aspect of the downloadable futuristic novel is very intriguing (I’ve yet to get the app due to my own iphone issues but did view it on another attendee’s phone) allowing the reader deeper levels of engagement. With the purchase of the $1.99 app, daily downloads are delivered automatically to your iPhone in segments short enough to read in roughly 15 minutes. 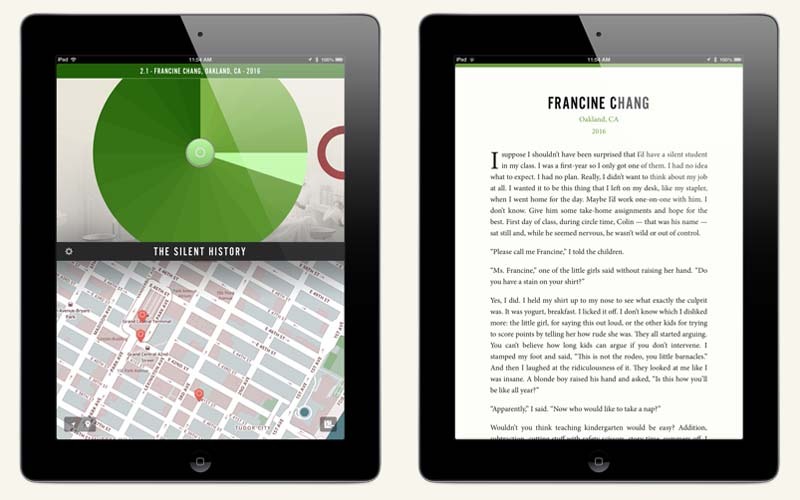 The interactive quality of the field reports not only allows people to write their own, it also teaches the readers to observe their surroundings in a different way; noticing details that usually go unnoticed by making them relevant to the text. A flagpole and the security camera next to it, both hanging from a storefront, are integrated into the story and place you right there as you take note of them in person. A gold-painted brick in the wall at the Allen Street Mall bathrooms is written into the report, and a reference to a yogurt and vodka party point you to the empty containers found in the planters. It all makes for good fun; a literary treasure hunt of sorts and completely immersive. Published by Ying Horowitz & Quinn, (all three having worked at McSweeney’s; Horowitz as the former publisher) with a list of credits that truly impresses, The Silent History revolutionizes the novel as we know it. 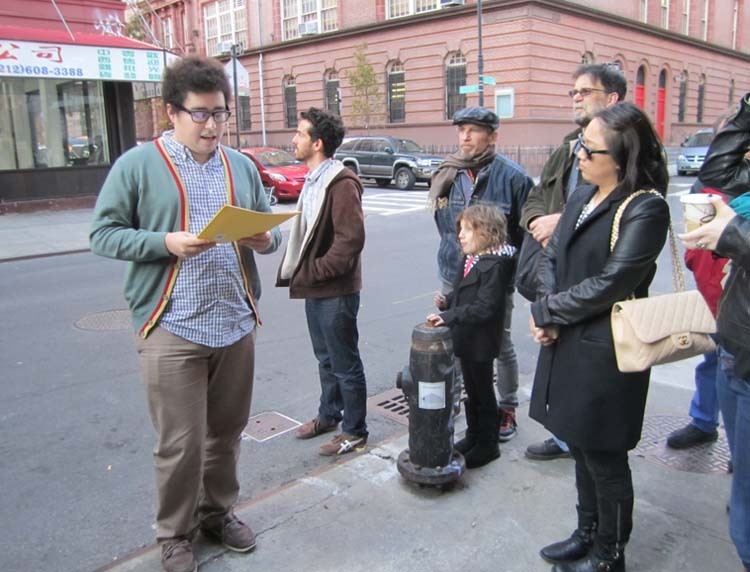 Matt Derby and Kevin Moffett, writers and collaborators on the project, were on the walking tour as well, reading their latest field notes on location. If all this wasn’t enough of a treat, the 20-or-so of us on the tour were treated to a mini private tasting at the very popular and hard to get into Mission Chinese Food on Orchard Street where we experienced the deliciously spicy and unique plates in the company of interesting people, some already hooked on The Silent History. These three guys, and I imagine all their collaborators as well, are truly inspiring with their creativity and out-of-the-box thinking. There’s an instant happiness that kicks in, as if contagious, listening to them describe the project. Check out the trailer below and download the app here. This entry was posted in Event, Food, Fun, Graphic Design, Interaction Design, Just Plain Cool, Pop Culture, Stuff We Like. Bookmark the permalink.